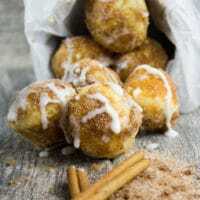 These Baked Donut Holes are made in a mini muffins pan, then brushed with melted butter, rolled in cinnamon sugar and drizzled with a vanilla cream cheese glaze! Pure lush! Place all the dry ingredients in a bowl and whisk them up. In another bowl, whisk all the wet ingredients and then add the dry ingredients to the wet ingredients and mix them well. Be sure not to over mix the batter. Scoop the batter into a mini muffin pan (24 cavities). Bake the donut holes for 9-12 minutes depending on your oven. They will puff up and bounce back when pressed lightly at the center. Allow them to cool for a few minutes and then remove them from the muffin pan. Mix cinnamon and sugar. Brush the tops of each donut hole with the melted butter and dip it in the cinnamon sugar bowl. Repeat with the remaining donut holes. Mix all ingredients together in a bowl. If the icing feels too thick, add milk a little bit at a time and whisk to make sure it doesn’t thin out. If you feel the icing is too thin, add a tablespoon of cream cheese with a tablespoon of confectioner sugar and whisk it in. Drizzle the donuts lightly with the vanilla glaze. By using a mini muffin pan, these baked donut holes are done in half the baking time. You can dip the whole donut into butter, but brushing the tops already does the trick. Feel free to add some ground cloves, ginger, nutmeg and cardamom to the cinnamon sugar for chai spiced donut holes.